As is all too often the case with the interesting parts of science, we don’t know much about this phenomenon but we have a good name for it: Earworm, a translation of the German Ohrwurm. (Use the German if you want anyone to pay attention to you in the faculty lounge.) People have been interested in earworms for a while now—Mark Twain used one as a plot device in his 1876 story “A Literary Nightmare.” They’re the most common type of what’s called “involuntary imagery,” sounds, pictures, smells, and even tastes that repeatedly come to mind unbidden. One theory is that earworms are a form of mild musical hallucination (normally a rare experience), the distinction being that with an earworm you A. usually aren’t on drugs or suffering from schizophrenia and thus B. are fully aware there’s no actual music being played outside of your skull. Another theory is that earworms are a side effect of your brain trying to consolidate memories, akin to what happens in REM sleep. Yet another possibility is pondered by neurologist Oliver Sacks in his book Musicophilia: earworms might simply be a consequence of our being surrounded by music in our lives whether we want to be or not. A more promising line of investigation in my opinion is to focus on the earworminess of particular songs. Una contacted the office of James Kellaris, a professor of marketing at the University of Cincinnati who’s styled himself “Dr. Earworm” after years studying the subject, to learn more about a theory of his known as “cognitive itch.” According to Kellaris, “certain pieces of music may have properties that excite an abnormal reaction in the brain”—in other words, your brain detects something extraordinary or unusual about the music that compels attention. Your brain tries to process the itch by repeating it, which only makes things worse—not unlike an epidermal itch. Kellaris finds the music most likely to cause an earworm has one or more of three key qualities: repetitiveness, simplicity, and what he calls incongruity, often an unexpected rhythmic variation. One example he gives is the song “America” from West Side Story, which features a repetitive melody and shifting time signatures. 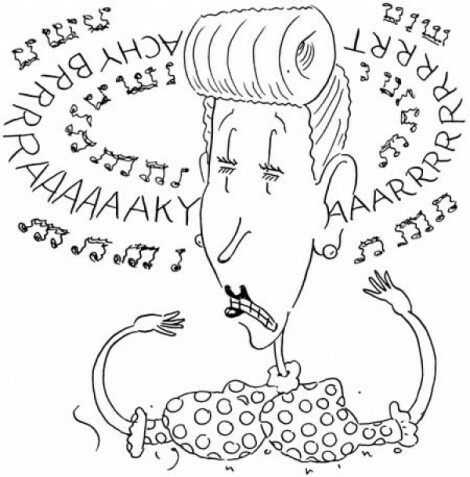 A 2003 study by Kellaris showed that nearly 98 percent of people experienced earworms, usually involving sung rather than instrumental tunes. While women and men experienced earworms equally often, women had to put up with them for longer and were more likely to be peeved. Kellaris’s research also suggests that musicians and those inclined to worry are particularly susceptible to worm attacks. In the early 1980s, Chicago parkinggarage bigwig Myron Warshauer used earworms as the basis of a patented “musical theme floor-reminder system,” in which a different well-known song plays in each floor’s elevator lobby. When you come back hours later and can’t remember what floor you parked on, all you have to do is pay attention to the tune that’s (theoretically) still running through your head—the song titles are listed opposite the buttons in the elevators. oneself with something else, listening to the piece in question, talking to others about the earworm, or just waiting the worm out.